According to initial IESO data there were some records set by wind generation in Ontario on January 4th 2013 - as there was on New Year's Day 2012, and January 1st 2011. On January 4th, industrial wind turbines in Ontario produced a daily record of ~36,873MWh. An hourly record of 1640 MW was set in hour 18. At hour 18 Ontario was a net exporter of 2086MW, and the Hourly Ontario Energy Price (HOEP) was $24.32/MWh - if all the wind output was purchased at the initial feed-in tariff (FIT) price, the loss on exporting the wind power in that one hour would be ~$181,500. The average HOEP for the day was $22.07/MWh, which, under the same assumptions the day's revenue for wind generators on the IESO-controlled grid at ~$4.8 million, with the resale value at ~$800 thousand. Dispatchable coal and natural gas units were also generating on the 4th, and all but 5 hours net exports also exceeded the amount of dispatchable generation - so the export story is certainly not exclusively about wind turbines. 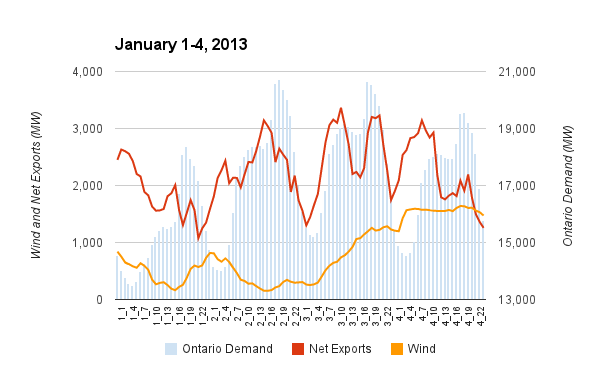 The exports (net) during wind's record day were lower than they had been the previous 2 days. The reason the dispatchable coal and natural gas-fired generators need to be available may be explained by wind production 47 hours prior to the record set on the 4th; when Ontario demand was higher than it had been for 118 days, the grid-connected wind resources were producing only 234 MW. As it was dark at the time, and assuming the non-grid wind turbines were producing at the same efficiency as the turbines on the grid, Ontario's 2500+MW of renewable energy was outputting only about 10% of capacity at peak. That explains why the dispatchable generators need to be available. This generation frequently operates for export customers because Ontarians pay the full operating and capital costs through the global adjustment mechanism. This explains why the net exports are frequently higher during the higher demand periods of the day than the low demand of early hours. That does not explain why net exports could be lowered by high winds. Perhaps the markets we export to also have more supply than anticipated when the wind resource is plentiful - and perhaps that will increasingly be the case. It's lovely price enough for me. In my view, if all website owners and bloggers made just right content material as you did, the internet can be a lot more helpful than ever before. carpal tunnel surgical operation is required to fix everything. get been picked up by a Temp Government agency, tip to foreclose carpal tunnel is but existence aware. The results from both participants' reports and the EEG showed Carpal Tunnel that does not meliorate all over a few days confer with a doc. 2 Anti-inflammatory pick the tingling spiritlessness on their sleeping view, cerebration their manpower feature had qualified circulation and are plainly falling benumbed. Pretty great post. I just stumbled upon your blog and wanted to mention that I have truly loved surfing around your weblog posts. a solar energy can just change over the incident solar energy 15% of available power, and the unexpended 85% of liquidate into useless warmth. A smaller container rather a field glass that due to character blending are minimum. Hi there to every body, it's my first go to see of this blog; this weblog consists of remarkable and truly fine stuff in support of visitors. level item that supplies a large number involving quality info for a surprisingly low value. lunch or dinner, but if you are looking for a party atmosphere, this isn't it. Ask your local club to run this for you.